Program Note: Don't miss Anderson's conversation with the book's authors Scott Conroy and Shushannah Walshe tonight. AC360° 10 p.m. ET. IN A CONDOMINIUM SUITE at the Arizona Biltmore Hotel, Republican vice presidential nominee Sarah Palin read over the election night victory speech that she would never have the chance to deliver. Thank you all so much. And thank you, America, for the great responsibility that you have given to President-elect John S. McCain. It was just minutes before the stirring moment when the official results would begin to trickle in, but as the sun descended toward the desert horizon, her fatigue must have been crushing. Palin’s two months on the trail had been not just physically exhausting but mentally draining. This short, strange trip had tested her in ways that might have broken even the most hardened political pro, and she had suffered more than her fair share of setbacks and embarrassments. 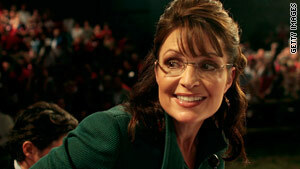 Still, it was Palin’s gripping story and alluring personality that had breathed life into a once flatlining campaign. Her addition to the ticket had sparked a flood of donations, standing-room only crowds at rallies, and a surge in the polls for the Republican ticket. But along with Palin’s many positive contributions to the campaign had come as many ruinous malfunctions. In the final hours of this frenzied voyage, she would discover just how expendable she had become, as the McCain campaign was literally about to turn the lights out on her. How had she skyrocketed so quickly into the stratosphere of American politics? Who had really been at fault for her many public stumbles? And what was it about Sarah Palin that drew such passion from both her fans and her foes? Even with the benefit of the thousands of hours of media attention that had been devoted to her candidacy, the heat of the moment did not afford the perspective for anyone to answer these questions adequately, least of all the candidate herself. On this last night of the campaign, Palin remained focused on the momentous judgment that the American people were about to deliver. Palin and more than a few of her aides had earnestly believed all fall that they could come from behind to win the thing, even though McCain’s top advisers knew the near collapse of the financial system in October likely foretold the Republican ticket’s doom. Yes, the crowds that had greeted her were enormous and passionate, and, yes, there was always hope that God would answer her prayers and grant her just one more miracle in what had been a string of unlikely successes in her short political career. But the recent polls were uniformly grim. She turned her attention to the other set of remarks that had been penned for her, the concession speech. Like the victory address, its very existence would remain a secret after McCain and his inner circle denied her the opportunity to deliver it later in the night. I wish Barack Obama well as the 44th president of the United States. If he governs America with the skill and grace we have often seen in him, and the greatness of which he is capable, we’re gonna be just fine. And when a black citizen prepares to fill the office of Washington and Lincoln, that is a shining moment in our history that can be lost on no one. It was a poignant passage in the far less triumphant of the two speeches that Matthew Scully, a former speechwriter for President George W. Bush, had written in advance of either outcome. A cerebral animal-protection activist, Scully was an unlikely wordsmith for the governor who could field-dress a moose. He had also penned Palin’s game-changing address at the Republican National Convention, field-dressing Obama with charges of arrogance, elitism, and inexperience. This time, however, he was exceedingly cordial in a manner appropriate for the occasion. Palin scribbled in another line with her black pen, dropping a cherry atop the hot fudge sundae: God bless you and your beautiful family, President-elect Obama. She had first discussed her victory and concession speeches with Scully two days earlier, when they spoke in Room 719 of the Mc – Kinley Grand Hotel in Canton, Ohio. Like Scully’s former boss and many of his predecessors in the Oval Office, Palin was the kind of Christian who felt comfortable expressing her faith in public, which the speech reflected: I will remember all the people who said they were praying for me. She squeezed another handwritten line in the margin, perhaps in an attempt to get the last word in against some of the McCain aides who thought it was better for her to tone down the God talk: You prayer warriors have been my strength and my shield. Editor's Note: The above excerpt was taken from the book, Sarah From Alaska: The Sudden Rise and Brutal Education of a New Conservative Superstar by Scott Conroy and Shushannah Walshe. Excerpted by arrangement with PublicAffairs, a member of the Perseus Books Group. Copyright © 2009.